As the human populations in Asia continue to rise, so the islands in which the last remaining tigers try to survive, come under more and more pressure. A young male tiger, at the age of dispersal, searches for a territory in which to establish himself. Sooner or later he encounters domestic stock at the edge or even in the park. Slow moving goats, cattle or sheep are much easier prey than the fleetfooted indigenous prey. Herdsmen retaliate with guns, traps or poison. When it comes to conflict between humans and tigers, tigers will always be the loser. Under this scenario a young male may choose not to disperse. If he mates with his sisters or his mother, an inbred population develops. At Tiger Canyons, a unique experiment has been going on for some time. The experiment involves the introduction of tiger cubs born in captivity into a litter of tiger cubs born from a wild tigress. Unknowingly, the wild tigress is raising the introduced cub, so the genetic diversity of the tigers in the besieged park is strengthened. 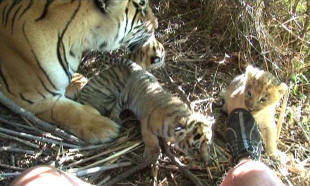 On the 27th of November 2006, Julie gave birth to three male cubs at Tiger Canyons. I immediately set about searching for a tiger cub of a similar age but was unable to find anything. 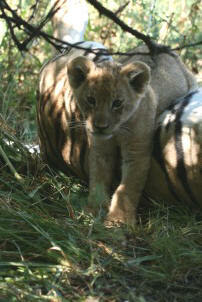 I did however find a lion cub of similar age at Ingrid Swart's Boskoppies Game Reserve. 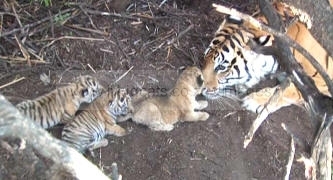 If I could introduce a lion cub into a tiger litter I would surely be able to introduce tiger cubs. I agonized over the decision. If Julie could tell the difference she may kill the cub immediately. If I introduced a fourth cub there would be added complementation for milk which could endanger all the cubs. Would she know the difference between 3 and 4 cubs? My experience with leopard is that they can't count. The scent of the lion cub would undoubtedly be different. How important would this be? Would it cost the lion cub her life! I was not that worried about colour. Lion and tiger cubs are similar in colour except that tiger cubs have stripes whereas the lion cub has spots on the top of the head. 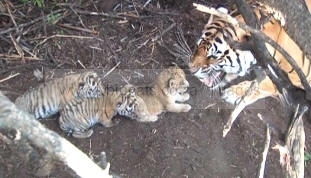 Tigers have been known to raise white and normal cubs in the same litter. I decided finally to remove one tiger cub and substitute the lion cub. This would keep the number of cubs the same - at three. The introduction went smoothly. The lion cub, a female, was actually slightly larger than the tiger cubs. This was good because it meant she could compete for milk with the tigers. I hoped that I could go straight from the lioness to Julie with the cub. I didn't want to bottle-feed the lion cub as this would create more foreign scent for the lion cub. Although temperature reached 42°C and we had a five- hour journey, the lion cub traveled beautifully without any bottle feeding. The moment of truth had arrived. 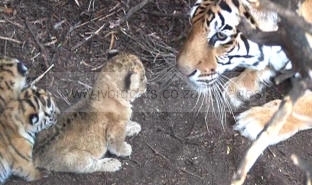 I introduced the lion cub into the litter while Julie was away feeding, and I removed one tiger cub. I rubbed the lion and tiger cubs together and used any urine, dung that I could find in the den to rub onto the lion cub. My relationship with Julie is such that I can sit in the den with cubs with no fear of aggression from Julie. This is a rare and unique privilege. With me I had a Canon digital still camera and Sony DV high definition movie camera. After half an hour Julie returned to the den. Her reaction was dramatic. She singled out the lion cub immediately and began to hiss aggressively at the lion cub with open jaws. At this point I was of the opinion I had made a terrible mistake and the lion cub would soon be dead. I considered trying to remove the lion cub but thought Julie may redirect her aggression onto me. I waited and recorded the drama on film. Although Julie's jaws were wide open, the lion cub did not back down. 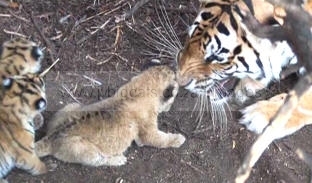 In fact the lion cub pushed her face up against the snarling tiger. I greatly admired the lion cub's courage. Then Julie cuffed it with her paw. My heart sank. How do I get this courageous lion cub out of danger? At this point the lion cub moved away from the den. Julie went after it. This is the moment she kills the cub, I thought. Gently Julie guided the lion cub to the den. Then she lay down and began licking the lion cub. The lion cub began to search for the teat as Julie encouraged her to suckle, but the cub was unable to find it. By now it was almost dark in then den, I felt drained but elated at what had transpired. I had watched events unfold from just 6 feet away from Julie and her cubs and she had not shown any hint of aggression towards me. At first light the next morning I was back in the den. All three cubs were suckling and I filmed Julie licking and grooming the cub like her own. She had fully accepted the lion cub. During the next 3 days I spent several hours in Julie's den observing her and the cubs. One morning she decided to leave the den and transfer the cubs to a new den site. As she left the den with one tiger cub in her mouth, the remaining tiger cub got caught in a thorn bush and began to give a distress call. Calmly she deposited the cub in her mouth into my lap as if to say "hold this while I fetch the second cub"
It was a incredible act of faith and trust. Certainly one of the most magical moments I have ever experienced with a big cat. One of the things I believe Asian conservationists can do, is to set up captive breeding programmes alongside their parks. From these breeding programmes, they can do cub translocations into wild litters. They will have to immobilize the tiger mother during the operation but it is entirely possible to strengthen diversity and numbers of cubs in wild litters.